6-CD Box (LP-Format) mit 44-seitigem Buch, 177 Einzeltitel. Spieldauer ca. 466 Minuten. Texas Troubadours, waren eine der besten Countrygruppen des Jahrzehnts mit Musikern wie Jack Drake, Leon Rhodes, Buddy Charleton, Jack Greene und Cal Smith. ErnestTubbs Texas Troubadours begleiteten ihn nicht nur auf seinen Tourneen, sondern waren auch bei seinen Aufnahmesitzungen dabei. So wurde sichergestellt, dass sein Sound nicht verfälscht wurde. 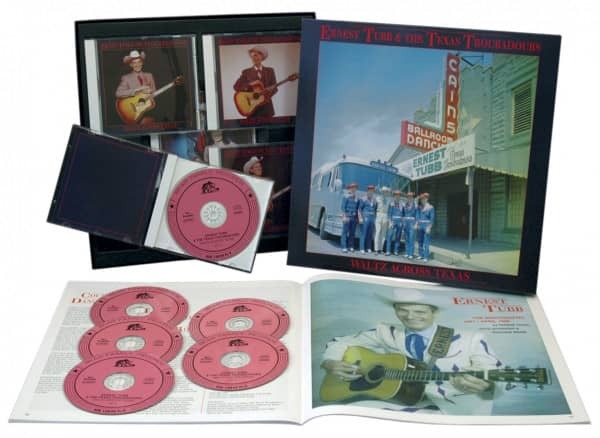 Til My Get Up And Go Has Got Up And Gone enthält diese Edition das legendäre erste Troubadours-Album, 'Ernest Tubb Presents the Texas Troubadours'. Es liefert einige der kompaktesten, swingendsten und jazzigsten jemals aufgenommenen Country-Instrumentals. Dann sind da die frühen Duette mit Loetta Lynn und natürlich alle Alben dieser Zeit wie 'Just Call Me Lonesome', 'Thanks A Lot' und 'Family Bible.' 1965 wurde er zu Recht in die Country Music Hall of Fame aufgenommen. Er war der sechste Interpret überhaupt und der dritte lebende Künstler, dem diese Ehre zuteil wurde. Die 177 Aufnahmen auf den 6 CDs in dieser Ausgabe enthalten 42 unveröffentlichte Aufnahmen. Das Buch wurde vom Ernest Tubb-Biografen Ronnie Pugh geschrieben. Detaillierte Angaben zu den Aufnahmesessions der Troubadours hat Rich Kienzle analysiert. 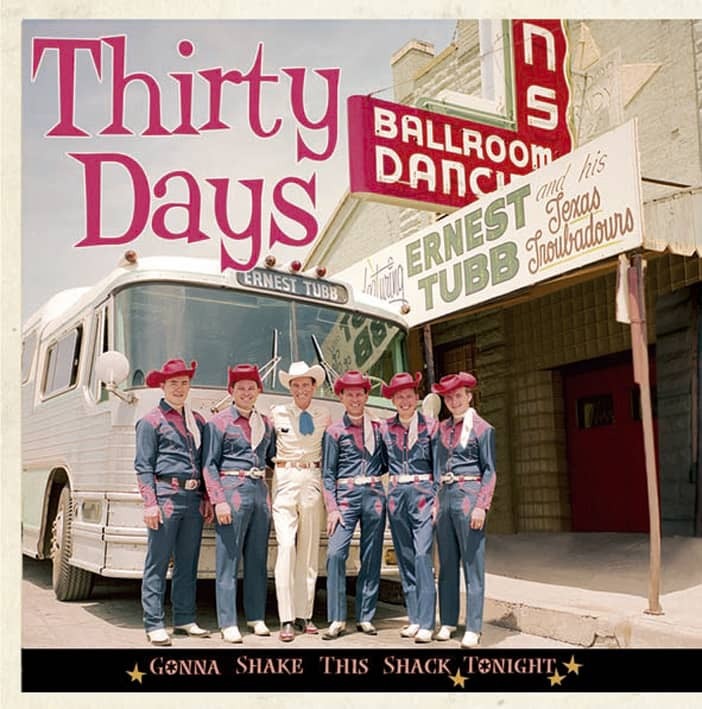 Late in life, when Ernest Tubb found it hard to sleep, he'd leave the house, go to his tour bus, start the engine, lie down on a bunk, and fall asleep in minutes. He'd spent most of his life on the highway, whether threading through rural Texas during the Depression or traveling the interstates in the modest luxury of his air-conditioned Scenicruiser. His life was a little catechism in what it once meant to be a country star. He took his music to isolated hamlets and he'd stand outside the dance hall, whether in bone-chilling cold or stifling heat, until every autograph had been signed, every hand shaken, every photo snapped. That was the old way. That was the E.T. way. These recordings ooze character and believability, and thus imperfection. The voice might waver off-key, especially during those characteristic trailing notes, and the band might flub a note or two, but the gritty realism and human warmth more than compensate. 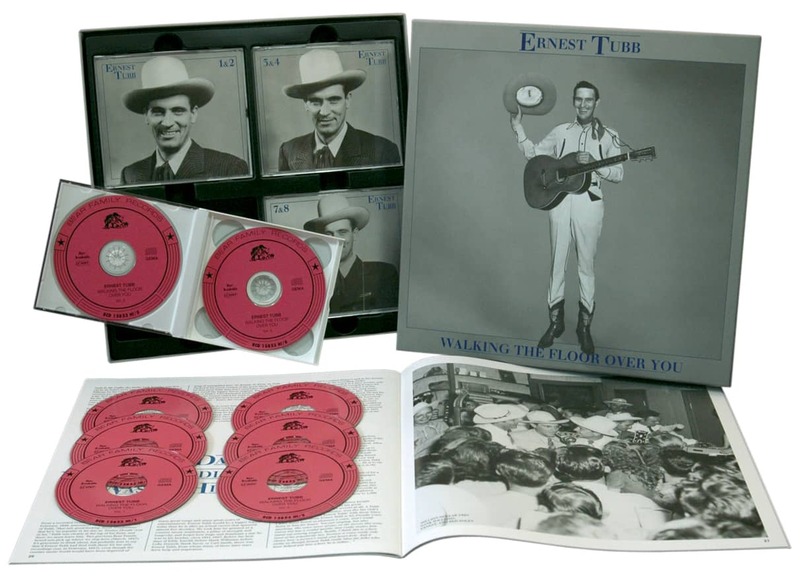 Ernest Tubb made records that could only be Ernest Tubb records. The contrast with the cookie-cutter similarity and diamantine perfection of today's country music could not be more obvious. "I don't read music," Tubb once said, "and I'd fight the man who tried to teach me. I don't care whether I hit the right note or not. I'm not looking for perfection. Thousands of singers have tried that. I'm looking for individuality. I sing the way I feel like singing at the moment. I never sang for the dollar. I sing because I want to sing." Ernest Tubb bridged the pre-War music of Jimmie Rodgers and the post-War world of the honky tonk and the Nashville Sound. Tubb's family were farmers near Crisp, Texas, a tiny settlement ten miles east of Waxahachie, where the population topped out around 200 between the wars. Ernest Tubb was born on February 9, 1914, and came of age at the dawn of the country music business. Today, country means Nashville, but back then country meant Appalachian folk ballads, polkas, cowboy songs, and western swing recorded in hotel rooms and warehouses across the southern and western states. Jimmie Rodgers was the first to unify some of this music, and that's why he's called the 'Father of Country Music.' Ernest Tubb was one of many to grow up in Rodgers' long, consumptive shadow, but the only one to earn his widow's personal endorsement. Mrs. Rodgers even arranged for Tubb to make his first recordings for the late blue yodeler's label, RCA Bluebird. Tubb's RCA records were unsuccessful and, if we're being honest, not very good. And so it took some arm twisting on the part of Mrs. Rodgers for Decca Records to sign Tubb in 1940. At that time, Tubb was working in San Angelo, and he'd begun writing songs that owed a less obvious debt to his mentor. He'd stopped yodeling and brought the electric guitar into his line-up to cut through the noise of the honky tonks. His band, the Texas Troubadours, always featured accomplished musicians, but at his insistence they kept it simple and kept it country. By the spring of 1941, Ernest Tubb had seen six releases on Decca, none of them good sellers, and Decca was on the point of dropping him. He'd moved on to Fort Worth, but his wife, Elaine, had left him, and pacing back-and-forth in his rooming house one night he wrote Walking The Floor Over You. Around the same time, he wrote another sour valentine to Elaine, Mean Mama Blues, basing it on Jimmie Rodgers' Mean Ole Bed Bug Blues. Mean Mama Blues and Walking The Floor were recorded in April 1941, and became huge hits. Tubb's next smash, You Nearly Lose Your Mind, was released just as wartime shellac rationing was crimping record production, but it was so popular that Tubb used it as a set-opener for nearly twenty years. By this point, he was a star in the southwest, and his ascent heralded a new style of music. The War had revived the economy and people once more had money to splash around. Beerhalls catered to both wartime prosperity and the wartime need to escape. Ernest Tubb played Texas beerjoint music, later dubbed Honky Tonk. One of the first in-depth articles about him, written by Ed Linn for 'Saga' magazine in 1957, addressed those early days: "Ernest Tubb began singing in the oil-field honky tonks of Texas in the late 1930s. It was a poor Saturday night that didn't produce a couple of interesting brawls. Tubb had to meet the competition as best they could. 'The harder they fought,' he says, 'the louder we played.' One night, a friend took a five-minute break and came back to find a bullet-ridden body sprawled across the wreckage of his guitar. It was disconcerting. Good guitars were hard to come by in those days." The early hits on this collection didn't chart because there were no country charts. When 'Billboard' inaugurated its Most Played Juke Box Folk Records chart in January 1944, it was a reflection of how successful Tubb and his contemporaries, like Roy Acuff, had become. They'd forced the New York-dominated music business to take notice of them. Some of the early hits were reissued after shellac rationing ended and after the country chart had been introduced. You Nearly Lose Your Mind reappeared in 1948, but when it stalled at #15 it was no reflection upon its popularity. Mean Mama Blues was re-released the following year, reaching #6, which again was no measure of its success. 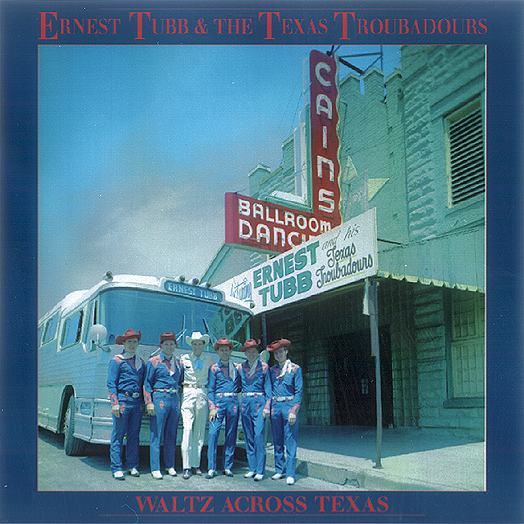 Kundenbewertungen für "Waltz Across Texas (6-CD)"